When we moved into our new place a little over a year ago it was oddly void of window coverings. I guess the previous owners didn’t like them, though the house looked okay without them when we checked it out. After moving in we realized how much we disliked having nothing to cover the windows in the evenings. So this is what I came up with. I picked up the drop cloths at Home Depot – two big ones for $10. 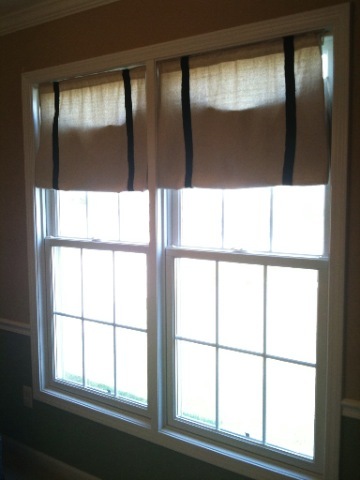 We have similar curtains on all of the main floor windows and some in the basement as well. Soon there will be some in the master bedroom, maybe embellished a but if I can make up my mind. Please let me apologize now for the quality of the pictures. It’s hard to get good curtain pictures, especially when it’s sunny out. These are the dining room curtains, in front of the slider. I hemmed a pocket on top and slid them on the rod. I made the rod out of a closet rod from the hardware store with finials screwed into the ends. 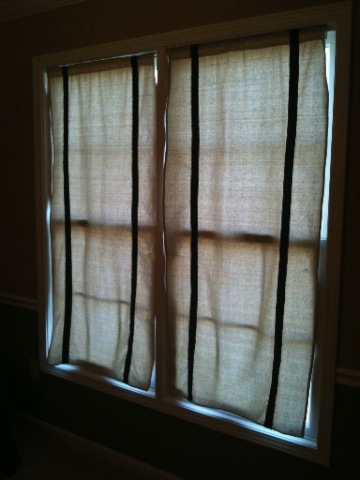 These curtains spend most of their time pulled up, either both over the ends like on the right or both gathered with the belt piece in the middle of the left one. Lots of options here folks. 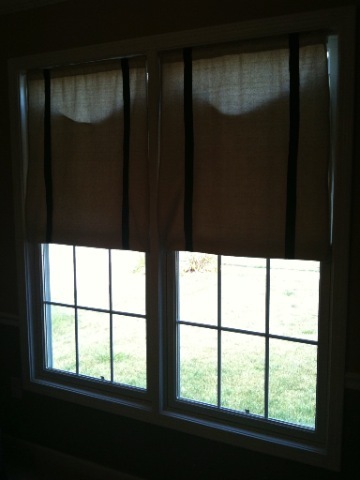 These are the curtains on the front windows. I made them to look like faux Roman Shades. They still need another panel to cover the tops but that will come at a later date. These are all about the options too! They are drop cloths, cut to fit the windows. They hang by a tension rod slid through a sewn in pocket at the top. The ribbons are sewn down the length for an added touch. 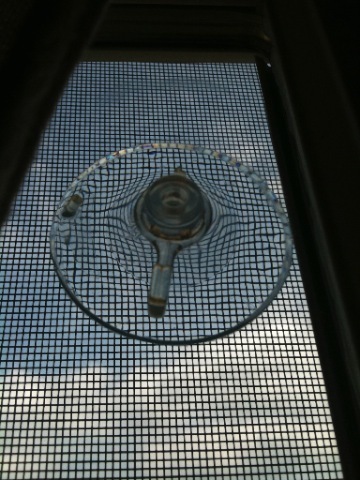 The gathering is achieved by using suction cup hooks and drapery hardware (little plastic circles). Basically I hung the panels on the tension rods and played with how I wanted the folds to hang. 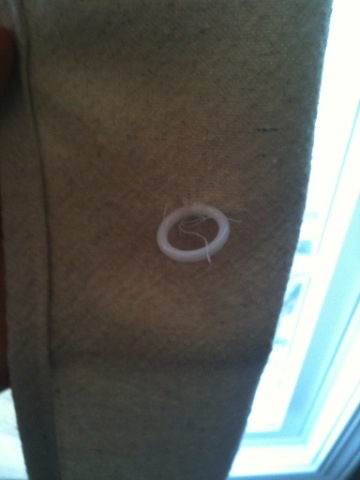 I marked them and then zig-zagged the rings on. You could sew them by hand too. Side note – white thread hides well on the drop cloth fabric. In the top shot there are two rings per side hung on the hook and the third fold is just done by hand after you put them up. The fabric has enough grab to stay up on its own. Here they are hung on both sets of rings without the manual fold. And hung on only one set of rings. I don’t know that these will be our forever curtains but for now they are blocking the light out on the sunny days and keeping the house cooler and keeping the privacy at night. And for the price I don’t think they can be beat! If you have any questions about how they were done don’t hesitate to ask! Absolutely love your tricks, easy, cheap and good result. I am quite useless at sewing myself, one of these days I promise to start learning with my sewing machine (bought 2 years ago), the thing is I never have time, my roman shades took a long time and as I double them with dark black out fabric inside for the night they are quite heavy and the result was not really good. You have inspired my to have another look at it and look for a way to sort them out.